I love the question – if you couldn’t fail to succeed what would you be doing with your life? Do you know what you would like to be doing with this one precious life of yours? Are you doing it? If not, why not? Fear of failure and fear of ridicule are common major obstructions in our lives. We all experience these feelings at times in our life. Noe of us know how long we are going to live. What feels worse – fear or failing or the regret of not trying? We all have passions and dreams – do we all listen? No. Our dreams and yearnings are frequently considered to be messages from our soul/highest self about our true life’s purpose – what we have come to this earth to bring and experience. When we are living our life purpose, we get a greater sense of fulfilment, contentment, belonging, connection and self-worth. We can feel more alive, enthusiastic and passionate about life. In a materialistic society, we are frequently fed the line that the more objects we acquire, the more brand new and financially valuable they are – the happier we will be. But is this true? Have you ever stopped to ask yourself what will make you truly happy? What do you really want? 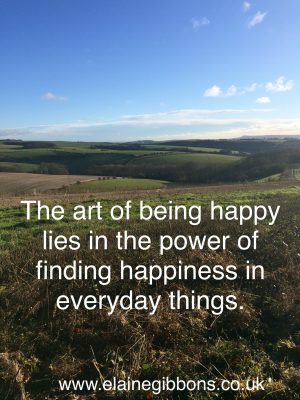 Generally the answer to these deeper questions is happiness, inner peace, fulfilment, contentment, feeling loved, feeling loving, feeling motivated and alive. I would like to propose to you that you wont experience these feelings from acquiring more material objects but from turning within and focussing on your hearts yearnings. Asking yourself the question – what feeling do I think acquiring this physical object is going to give me? What do you think a new house, new shoes, a holiday will give you – peace, freedom, relaxation, contentment, happiness? What can you do today and this week that will give you a glimpse of this. Is it going for a walk in nature, is it connecting with a loved one, is it eating better food, exercising more, having a relaxing bath, listening to some music? How often do you do the things you love? Make some more time for them. Allow yourself to dream. Listen to your dreams. Make small active changes each day, bringing yourself closer to fulfilling these dreams. Embrace the adventure of life. Feel the fear and do it anyway!